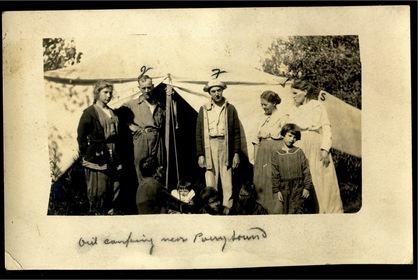 Comments: Susan Battice (Nee: Peel) | Toronto Ontario Canada | 1901-1920 | Comments: Out Camping Near Parry Sound, Ontario, Canada This photo, in my grandmother’s album, shows my grandfather Joe’s two brothers, Frank & John ROGERS, with their stepsister, Susan BATTICE, nee PEEL, and several other people, camping about 1910? I wonder if the others might be Susan’s brother Armour PEEL’s family? F-Frank Rogers, born 1874, Toronto, Ontario, Canada. J-John Rogers, born Toronto,1882 Their parents were Mary Ann WHITE & William ROGERS, both born in England. S-Susan Battice, nee Peel, born Toronto, 1863 Susan’s brother, Armour PEEL, married Rebecca PALMER in 1877. His and Susan’s parents were Armour Deprong Peel, born Ireland and Hannah, also born Ireland. Armour Deprong PEEL married Mary Ann WHITE in 1887 and Catherine DODGSON, nee AUSTIN in 1898.